Carefully put together in beautifully made albums, William Scruton clearly spent a lot of time and effort creating these scrapbooks that provide great detail and a chance to see the streets and buildings that once existed, as well as those that are still standing, such as the Old Paper Hall and the Parish Church. These scrapbooks include articles on a variety of topics that he felt were of importance, such as the new Post Office in Forster Square, old Bradford Chapels, the industrial and social movements in Bradford, local poets and musical events. There is even a dedicated album to the history of Horton, with all you could need to know about this town, the prominent families living there and how it used to look. 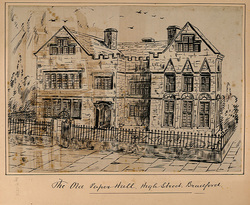 He had always had a passion for history, collecting many historical documents, and even published ‘Pen and Pencil Pictures of Old Bradford’ as a way to distribute his sketches of the Bradford he knew and loved to the masses. It included both views and portraits of the people and places which he thought would give the best representation before they were lost forever, a fact of which he was very aware. Find the majority of the scrapbooks under DB5/C31 - 34, various others within DB5, as well as WYB314 and WYB364. View the collection on our ﻿online catalogue﻿.